105 acres just south of Xenia with tracts from 11 to 46 acres - bid on one tract or any combination of tracts! Property sold for $275,000 (6,117 per acre) and is expected to close by January 25, 2016. This 68 Acre Farm sells November 18 at 4 PM. The farm features 59 tillable acres, flat to rolling topography, small stream & 1,152 feet of frontage. Good soils for crop production & great investment opportunity with future development potential. 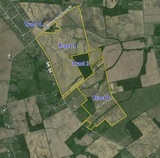 5 Tracts with 148 tillable acres and 3-bedroom home offered via the Multi-Parcel Auction Method. ($6,968 per acre) and is expected to close on or before July 18, 2014. Located just minutes from US 35 with easy access to I-71, I-70, and I-75, this farm will appeal to the farmer, investor, and the nature lover. Join us for this great opportunity to purchase a super farm! 65+ acre farm with over 50 acres tillable and 2-story house with outbuildings sells at the farm! Update: The farm sold to 4 buyers for $1,441,000 ($5,848/Ac). Tract 1 sold for $650,000 ($8,454/Ac), Tract 2 sold for $700,000 ($4,389/Ac), & Tracts 3 & 4 sold for $45,500 ea. Sale expected to close by 8/16/13.